My husband and I recently took our 3-year-old daughter on a trip to Brisbane, Australia. Traveling from Edmonton meant it would be a very long way to go. We had a series of 3 flights (with the longest being 13 hours), as well as layovers at airports in between. I took note of the things that really helped along the way for us during our 24+ hours of travel there and back. 3. Look for “parent rooms” in airports. Whether your child is potty-trained, in the middle of training, or still in diapers, parent rooms can be a life saver for families with young kids. 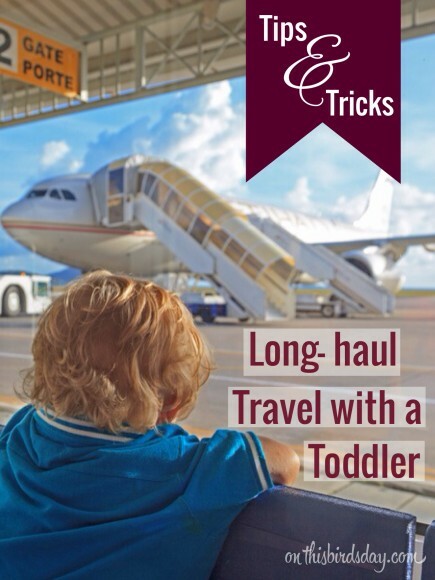 They provide more privacy than the traditional public bathroom, and often have lots of space for you to put down your many carry-on bags (you carry a lot of stuff when traveling with a toddler!). They can allow all of the family members to have potty time at once without worrying about stalls and bumping into other people. Also, some airport parent rooms even have play areas (we saw this in the Auckland airport – there was a gated play area with wooden beads and a rocking horse!) 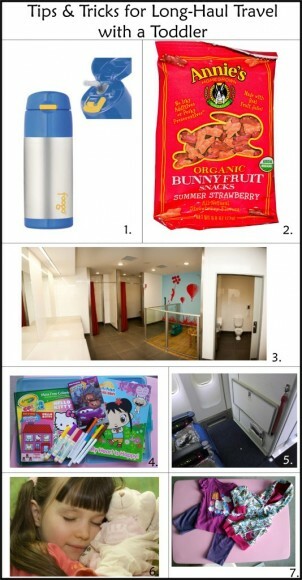 to keep your toddler entertained while you use the facilities or change a younger sibling’s diaper. 4. Bring compact toys and activities. A collection of small toys and figurines, magnet books, sticker books, colouring books, markers, etc. will be really helpful for your toddler while sitting on a plane. It is very difficult to expect a young child to sit still for many hours at a time – so be prepared with a variety of things you know they will enjoy. Bring things that are familiar to provide comfort and security, and bring new things that are pleasant surprises. I’ve heard people suggest wrapping up each little toy or activity to be opened every hour, so you can space out the special treats. I personally found that having both familiar favourites and new surprises was a good balance for airplanes and airports. 5. When booking your flight, try to get seats with more leg room. Sometimes you can request bulkhead seats which gives your child more space to move around. The downside is that you have to store your carry-on bags in the overhead bins, but as long as you board early (which you usually can with young kids), you should be okay with having enough space to store your bags. Some airlines require you to pay an extra fee for bulkhead seats. I personally found it was worth it to pay a small fee for these seats, because the extra room meant that my daughter could move around freely and not feel trapped in her seat. 6. If you want your child to sleep on a long-haul flight, make it as easy as possible. Bring a special stuffed animal, pillow, and/or blanket your child sleeps with to give them a sense of familiarity and security. If music calms your child, bring your music player and child-friendly headphones with a maximum volume control so there’s no risk of hearing damage. And, if you’re willing, try some liquid melatonin in their juice or snack to help them sleep better. 7. Bring 1 or 2 changes of clothes. If you’re traveling for 24+ hours like we were, your toddler is bound to get food smears on their clothes. Also, they might just feel itchy or yucky wearing the same clothes for that long. Having a set of clean clothes is an easy way to make your child more comfortable. Those are just some of the things that I found really helpful during our long-haul trip from Canada to Australia! 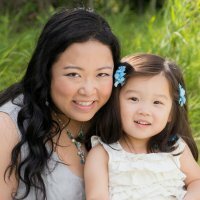 What are some of your go-to travel tips and tricks when traveling with toddlers?